Introducing our new Stand-Up Swing, a unique take on an old pastime for kids through history. Kids can safely stand on our larger (14 in. x 14 in. ), more sturdy, reinforced platform. The Stand-Up Swing helps to build strength and agility and provides for hours and hours of fun. The Stand-Up Swing is for children ages 3 to 10 and has a weight capacity of 115 lbs. It will hang on most playsets and includes everything for easy installation. Circular Rings & Trapeze Bar Combo from Creative Cedar Designs will encourage your child to explore their gymnastic ability from the safety of our backyard swing set! 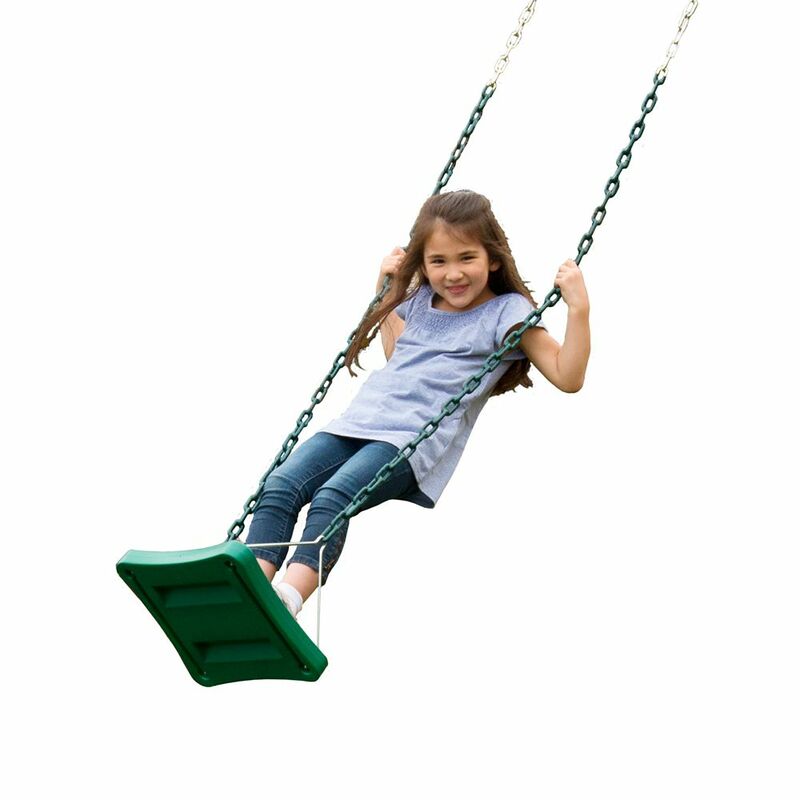 Add this fun playground accessory to any kids swing set to support the safe development of strength and coordination during hours of vigorous playtime. Includes trapeze bar and rings for swing set combo with quick-linked swing chains - swing hangers and mounting hardware sold separately. Fond family moments await you in this luxurious comfortable contoured seat. This Contoured Leisure Swing is an ideal place for parents to relax and enjoy watching their children, or for kids to take a break from activity to simply enjoy the fresh air. Stand-Up Swing in green Introducing our new Stand-Up Swing, a unique take on an old pastime for kids through history. Kids can safely stand on our larger (14 in. x 14 in. ), more sturdy, reinforced platform. The Stand-Up Swing helps to build strength and agility and provides for hours and hours of fun. The Stand-Up Swing is for children ages 3 to 10 and has a weight capacity of 115 lbs. It will hang on most playsets and includes everything for easy installation. Stand-Up Swing in green is rated 4.4 out of 5 by 10. Rated 5 out of 5 by Andres from Great value. Very satisfied with the quality. ... Great value. Very satisfied with the quality. Rated 1 out of 5 by jkfri from Kids loved it (both under 45lbs) and broke on them in under a year. Kids loved it (both under 45lbs) and broke on them in under a year. Rated 5 out of 5 by doylej from Very good swing. Grandkids love it for both sitting or... Very good swing. Grandkids love it for both sitting or standing. Good quality, all around excellent.